Daily practice is essential in a Buddhist’s life. We not only practice in all sorts of activities in the everyday life, we also need some time for the cultivation of the mind on wisdom and compassion. No matter if it’s only 5 minutes or extensively long to recite more than one sutra a day, the practice plants the virtuous seeds in both our spirituality and secular life. When the time is ripe, we harvest the fruit of awakening. To know how to structure your daily practice, here’s Master’s advice on Daily Practice. Composed by the 11th patriarch of Chinese Pure Land school–Master Xing’an (1686-1734), when he experienced the sudden enlightenment and generated the great vows of enlightenment for all living beings. 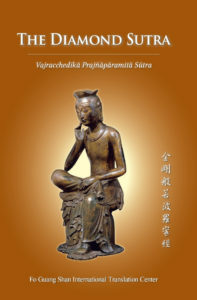 In this text, he repeatedly emphasizes the importance of generating the enlightenment mind and how to stabilize the vow in life-long practice. May it encourage the rise of your bodhi mind. The English-only text is available for download. 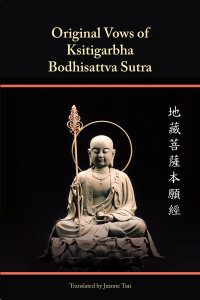 The Original Vows of Ksitigarbha Bodhisattva Sutra is a influential Mahayana Buddhist teaching on the Ksitigarbha Bodhisattva, who vows to attain the final enlightenment after the hell realm is emptied. 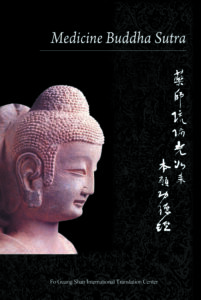 The sutra has been widely practiced in Chinese Buddhism for centuries. As the Buddha discoursed in the sutra, there are 28 great benefits from reciting this sutra, such as being protected by devas and nagas, receiving abundant food and clothing, accumulating superior causes for holiness. 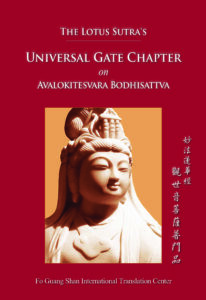 The Lotus Sutra’s Universal Gate Chapter introduces the compassionate visage of Avalokitesvara Bodhisattva (Chi:Guanyin), who has been a source of inspiration and devotion for Buddhists and non-Buddhists for centuries. This short chapter of sutra, chanted and memorized throughout East Asia, is believed to be a strong protection of our body and mind. Master Xuan Zang went through numerous extreme hardships and dangers on his way to India for requesting the Dharma. During his difficult journey, he heavily relied on the Heart Sutra (Prajñāpāramitāhṛdaya) and the profound meaning of Prajnaparamita. Eventually, he reached Nanlanda University, learned Sanskrit, and became the prominent master and translator in Chinese Buddhism. 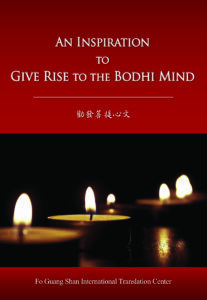 The Great Compassion Mantra (Chi: 大悲咒) is associated with the bodhisattva of great compassion, Avalokitesvara (Chi: 觀音). Reciting and upholding this mantra can bring practitioners the protection from all kinds of danger, helps practitioners cultivate compassion, and when one approaches to death, all the Buddhas of the ten directions will come to take them to any Pure Land as one wishes. The Chinese text with Pinyin is available for download. 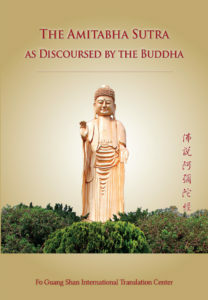 The Amitabha Sutra is greatly influential in Chinese Buddhism. Its practice has been highly emphasized in traditional monasteries and modern Buddhist temples. It introduces the wondrous Western Pure Land of the Amitabha Buddha and highlights the importance to be reborn there for one’s path to the final enlightenment. Out of Great Compassion, the Amitabha Buddha generated forty-eight vows and created the Western Pure Land for all virtuous practitioners. Regardless if we want to be reborn in the Pure Land, it is important for us practitioners to always be reminded of his great vows and contemplate on them in order to cultivate our own compassion mind. The English-only text is available to read online or download. All of our texts are offered as a gift of Dharma, supported by the donations of our readers. If you would like to support future translation and printing efforts, please consider donating.